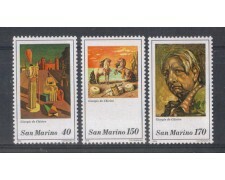 1979 SAN MARINO - Anniversario della morte di Giorgio De Chirico (Cat. Unif/Sassone N° 1042/1044 - Yvert. N°997/999) Serie completa di 3 valori in quartine nuovi gomma integra. 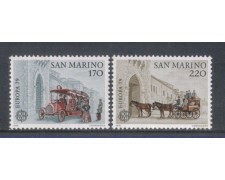 1979 San Marino - Anniversary of the death of the painter Giorgio De Chirico - Complete Series 3 new stamps MNH blocks of four. 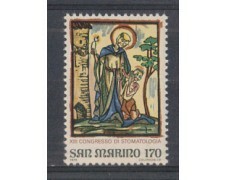 1979 SAN MARINO - Natale affresco di A. Alberti (cat. Unif/Sassone N° 1045/1048 - Yvert. N°1000/1003) Serie completa di 4 valori in quartina nuovi gomma integra. 1979 - SAN MARINO - NATALE AFFRESCO DI A.ALBERTI (UNIF.SASS.1045/048 Yvert. 1000/1003) SERIE COMPLETA 4v. NUOVI GOMMA INTEGRA ORIGINALE. 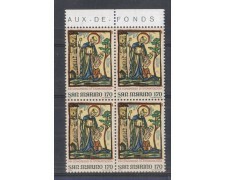 1979 San Marino - Christmas painting A.Alberti - complete set of 4 mint stamps MNH. 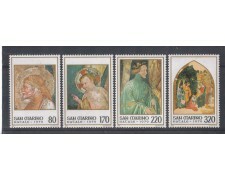 1979 - SAN MARINO - ANNIVERSARIO DELLA MORTE DI GIORGIO DE CHIRICO (UNIF.SASS.1042/1044 YVERT. 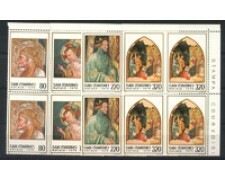 997/999) SERIE COMPLETA 3v. NUOVI GOMMA INTEGRA ORIGINALE. 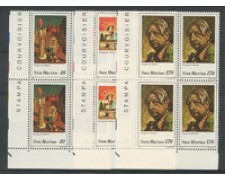 1979 San Marino - Anniversary of the death of the painter Giorgio De Chirico - Complete Series 3 new stamps MNH. 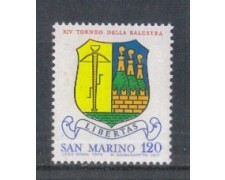 1979 - SAN MARINO - NATURA DA SALVARE (UNIF.SASS.1032/041 - Yvert. 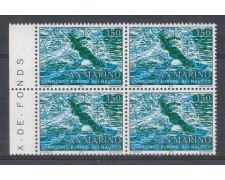 N° 987/996) SERIE COMPLETA 10v. NUOVI GOMMA INTEGRA ORIGINALE. 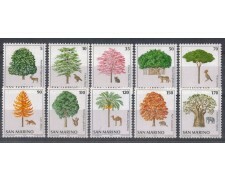 1979 San Marino - Nature to save full set of 10 new stamps MNH. 1979 - SAN MARINO - ANNO INTERNAZIONALE DEL FANCIULLO (UNIF.SASS. 1027/031 - YVERT.982/986) SERIE COMPLETA 5v. NUOVI GOMMA INTEGRA ORIGINALE. 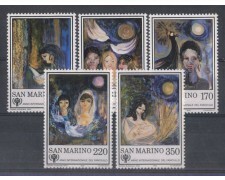 1979 San Marino - International Year of the Child - full set of 5 new stamps MNH. 1979 - SAN MARINO - 13° Congresso internazionale di Stomatologia ( Cat.Unifcato/Sass.1026 - Yvert.981) francobollo Nuovo gomma integra in quartina. 1979 - SAN MARINO - 13° CONGRESSO INTERNAZIONALE DI STOMATOLOGIA (UNIF/SASS.1026) NUOVO GOMMA INTEGRA ORIGINALE. 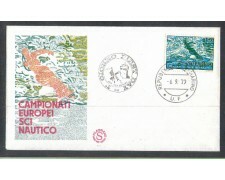 1979 - SAN MARINO - CAMPIONATI EUROPEI DI SCI NAUTICO (UNIF/SASS.1025) FDC (fILAGRANO). 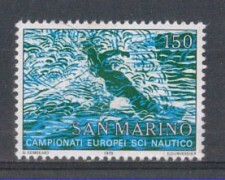 1979 - SAN MARINO - CAMPIONATI EUROPEI DI SCI NAUTICO (UNIF/SASS.1025) FDC (ALA). 1979 - CAMPIONATI EUROPEI DI SCI NAUTICO (UNIF/SASS.1025) QUARTINA NUOVA GOMMA INTEGRA ORIGINALE. 1979 - SAN MARINO - CAMPIONATI EUROPEI DI SCI NAUTICO (UNIF/SASS.1025) NUOVO GOMMA INTEGRA ORIGINALE. 1979 - SAN MARINO - 14° TORNEO DELLA BALESTRA (UNIF/SASS.1024) FDC (fILAGRANO). 1979 - SAN MARINO - 14° TORNEO DELLA BALESTRA (UNIF/SASS. 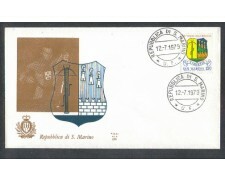 1024) FDC (ALA). 1979 - SAN MARINO - 14° TORNEO DELLA BALESTRA (UNIF/SASS.1024) QUARTINA NUOVA GOMMA INTEGRA ORIGINALE. 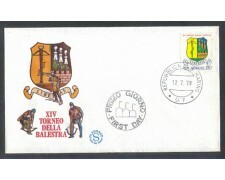 1979 - SAN MARINO - 14° TORNEO DELLA BALESTRA (UNIF/SASS.1024) NUOVO GOMMA INTEGRA ORIGINALE. 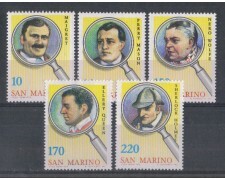 1979 - SAN MARINO - GRANDI INVESTIGATORI (UNIF.SASS.1019/023) SERIE COMPLETA 5v. NUOVI GOMMA INTEGRA ORIGINALE. 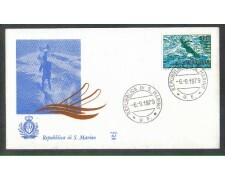 1979 - SAN MARINO - EUROPA STORIA DELLA POSTA (UNIF.SASS.1017/018 - YVERT. 972/973) SERIE COMPLETA 2v. IN QUARTINE NUOVE GOMMA INTEGRA ORIGINALE. 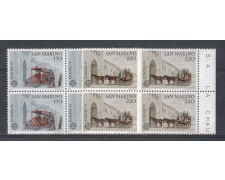 1979 San Marino - history of mail - Complete Series 2 new values ​​MNH - Block of four. 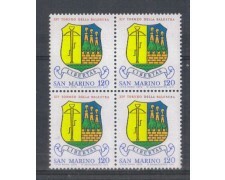 1979 - SAN MARINO - EUROPA STORIA DELLA POSTA (UNIF.SASS.1017/018 - YVERT.972/973) SERIE COMPLETA 2v. NUOVI GOMMA INTEGRA ORIGINALE. 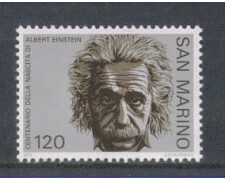 1979 - SAN MARINO - CENTENARIO DELLA NASCITA DI ALBERT EINSTEIN (UNIF/SASS.1016) NUOVO GOMMA INTEGRA ORIGINALE.